Muller Martini, the innovative, Zofingen-based machine manufacturer, had the great honor of being presented with the 2017 Swiss Industry 4.0 Award for its Finishing 4.0 book production line for runs of one copy at the Swiss Industry 4.0 Conference at the TRAFOCulture and Congress Center in Baden. With its forward-looking Finishing 4.0 strategy, which draws on Industry 4.0, Muller Martini ensures all its systems meet the requirements of the increasing customization and personalization of print products and the production of ultra-short runs. 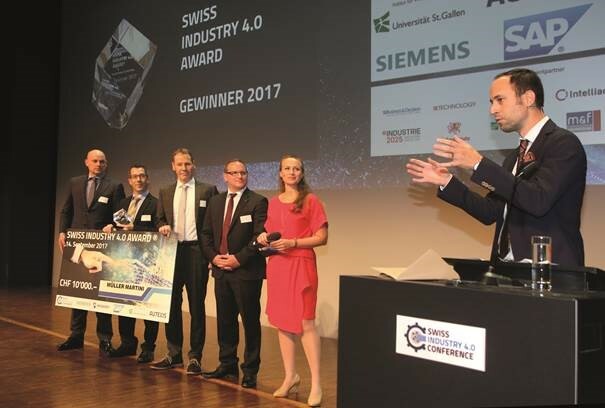 The book production system that won the 2017 Swiss Industry 4.0 Award boasts a seamless, touchless workflow, i.e. books can be produced in runs of one copy without manual interventions and setup time.